He, he .... mornin' everyone! It is just a WEE bit past midnight and I'm making my post and going to bed like a GOOD girl!!! Y'all are SO sweet in looking after my health! Thank you SOOOO much for the LOVELY comments and I am THRILLED that y'all are liking *SUNRISE, SUNSET*!!! Kim surely knows how to pick the colours, doesn't she? YUMMY! Thank you again girlfriend and I am surely going to miss you whilst you are away on holiday!!! CLICK HERE TO DOWNLOAD FROM DAWN'S BLOG! Oh, before I forget, I am going to post with each download a little reminder to wait a few minutes or come back later if you have difficulty downloading any of my goodies. Sometimes we just happen to be in downloading when MANY others are as well and we might get an error code. I've learned over time to just busy myself with something else and to come back at at time when I know the traffic won't be bumper-to-bumper and/or gridlocked!!! Hope y'all have have a FANTASTIC start to your week and I wish you a day FULL of SCRAP HAPPINESS!!! P.S. *SUNRISE, SUNSET* will remain active on my blog throughout the coming weeknend and will then be packaged up and put into my store at One Single Seed! Yes, I am finally going to put some things up for sale as I have spent OODLES on CU goodies and I need to make an attempt to balance the scale!!! Y'all know HOW that goes, eh? LOL! I will still be bringing you LOTS of goodies right here on my blog so NO worries about that!!! I will put a store link on my blog when I have at least five kits uploaded! LOL! No sense in sending you over there to empty shelves!!! HORRORS! ROFL! Remember, this Wednesday at NOON EST, the April DST Blog Train shall be departing and my preview and link will replace the old one at EXACTLY noontime on April 1st!!! I will have a link to the next blog included in my post, as well as a link to the blog train blog below my preview on the sidebar. OMGosh y'all, you won't believe many designers have contributed this time around!!! WOO, WOOOOOOOO!!! The name of this train is *SPRING BLOSSOMS*!!! *SUNRISE, SUNSET*, PART ONE HAS ARRIVED!!! WOO HOO! Today is my MOST favorite person on this earth's BIRTHDAY!!! Hmmmm .... and who might that be you ask? 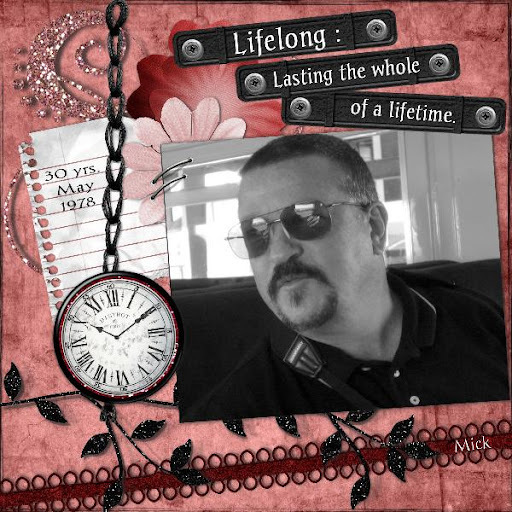 My DARLING, SWEET, LOVING and MOST incredibly WONDERFUL man, Robert!!! HAPPY BIRTHDAY SWEETHEART!!! Before I forget (and you KNOW I will!!! ), *SUNRISE, SUNSET* will come to you in THREE parts on three different days and then followed by TWO coordinating alphas. I am hoping to have a download each day this week, however, I might skip Wednesday, depending on my madness over here (LOL! ), to post my contribution to the DST April Blog Train!!! WOO HOO!!! YES, you read correctly! It is that time once again, SO prepare yourselves to be AMAZED as there are A LOT of AWESOME designers participating. I will leave the link on my sidebar and simply change the image so that you see the new goodies that I will have for y'all to download. I am SLOWLY catching up and hope to GET 'ER DONE by Tuesday!!! Thank you ALL so VERY much for your continued support and encouragement!!! HAPPY MONDAY!!! Have y'all had a FABULOUS weekend, OR what??? Come on now, you've just GOT to share with me what y'all have been up to! I'm feeling like I've been away on vacation and have SO much to catch up on!!! I am SLOWLY making my way back. I won't bore you with how I've been struggling, however, I will tell you that my focusing is getting better with each passing day!!! YAHOOOOOOO!!! I don't like not being able to create, but I do know that ALL things are for a purpose and I think I've needed to slow down a bit and catch my breath!!! Yes, yes, YES, y'all have been telling me all along now haven't you? I shall have to quit being SO stubborn and listen up, eh? LOL! 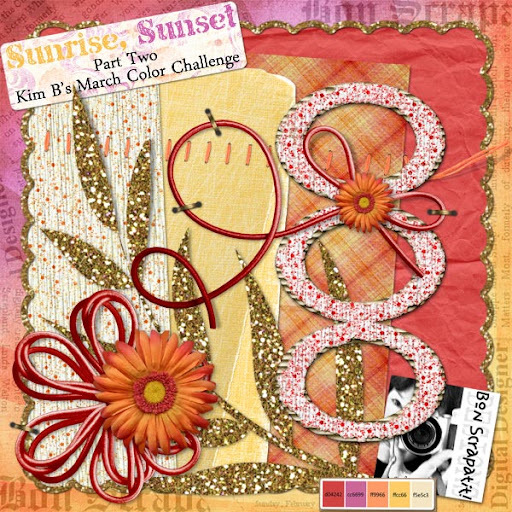 I am going to share a bit of my creation for my FIRSTEVER participation in Kim B's MONTHLY color challenge over at DSO! I've not posted in the forum yet as I still need to make up my previews as I am going to give my scrapkit out in two or three parts AND I've even made TWO alphas to coordinate with this one, which I've named *Sunrise, Sunset*!!! The color palette this month is SO delicious and HOT and just spoke to me of early day and our GORGEOUS sunsets here in the foothills of Northern California!!! You know, those FABULOUS sunsets that fill the sky with yellow, orange, fuschia and lavender!!! I LOVE them and Robert and I will sit out on our deck and relish in the beauty of our surroundings on warm evenings! Please know that ALL who are in the midst of horrific blizzards and flooding have been in my thoughts and prayers. The weather SURELY has been crazy this season and we've gone from COLD to WARM and right back to COLD here today! To those in the flood areas and the mid-west where blizzards have hit, PLEASE be safe!!! TO those who have had to evacuate, I wish you a safe return to your homes just as quickly as is safely possible. I hope as I am writing this that everyone has already been able to return - I've not seen any updates today. Below is a preview of Snowsmoon's Design's preview of her AWESOME alpha now available on her blog! Is that not just TOO sweet? Link to Dawn's blog is located beneath the preview! CLICK HERE TO DOWNLOAD ALPHA FROM DAWN'S BLOG! 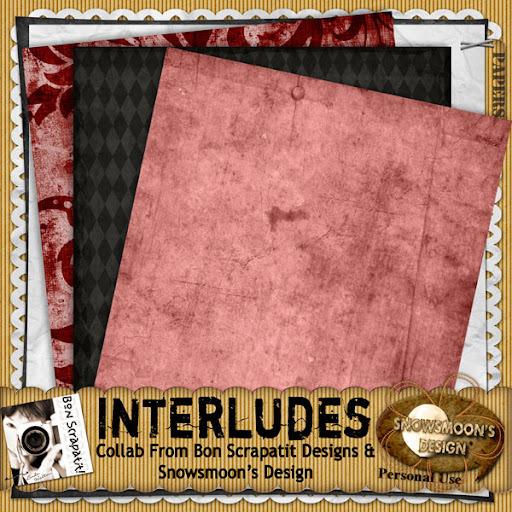 WAITING FOR THE FOG TO LIFT AND PART TWO OF KIM B"S MARCH COLOR CHALLENGE BY SNOWSMOON'S DESIGN! ROFL! Well, it is nearly 80 degrees with the sun BEAUTIFULLY shining today, however, I am patiently awaiting the FOG to clear so that I can see clearly - BRAIN FOG that is!!! Meanwhile, please hop on over to my BFF's blog (Snowsmoon's Design) and grab Part Two of her DARLING creations which are shown in the preview below! Please leave her some love and a thank you for her sharing her time and talent with ALL of us! MWAH! Wishing you ALL a FUN and SCRAP HAPPY weekend and, as ALWAYS, thank you for your CONTINUED support and KIND comments that REALLY help keep me inspired to create!!! Thank you for bearing with me as I SLOWLY make my way back into the HUSTLE 'n BUSTLE here in SCRAPLAND! 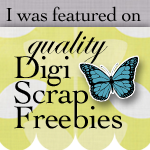 I'm stopping in to share a few freebies that are up on my my VIRTUAL daughter, Sarah's blog and my BFF, Dawn's blog!!! One of the INCREDIBLE things about participating in this particular challenge is that I get to share my creations with y'all RIGHT HERE on my blog! SO, I shall be pointing you in the direction of Sarah and Dawn's blogs and then I should be back later tonight or tomorrow morning with my contribution in the form of a mini-kit to share with y'all. I will also share with you my next project - WOO HOO!!! The train is moving once again! LOL! Sarah aka Designs by Sassy has been giving a new freebie out a couple of times a week as she is coming down the final stretch before her wedding on April 11th! Hop on over and check them out - they are CU-friendly and a FABULOUS addition to your already growing stashes! *wink* While you are there, leave her some loving for her efforts whilst not only preparing for her wedding, but also for caring for her SWEET Joshua who is in need of breathing treatments for 3 months. Little lamby, he is SO lovely! 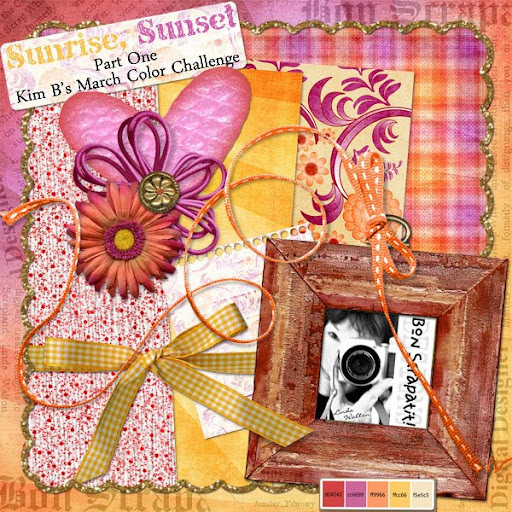 Dawn has already posted the first part of her contribution to Kim B's COLOR CHALLENGE at DSO! Here is her preview with a link right beneath it to take you directly to her post! ENJOY and make sure to check out all of the OTHER goodies in the DSO forum and gallery! AWESOME job girlfriend - I am LOVING the birdie with the FLOURISHED tail feathers!!! TOO SWEET! You REALLY know how to ROCK it Kim!!! MWAH! CLICK HERE TO BE TRANSPORTED TO DAWN'S BLOG TO DOWNLOAD! OVERDUE LO SHARES AND A BEAUTY OF A CELTIC QP BY MONNA LAINSON! Firstly, please let me say that I am OVERWHELMED with the SWEET, KIND, GENTLE and LOVING comments left for me yesterday and today!!! Can I say WOW??? Y'all CONSTANTLY amaze me with your heartfelt shares of your own experiences and those close to you. I was just expressing to Robert HOW much I love to get feedback from y'all in times of my perplexity!!! SO many of you came to my aide when I was struggling with what seemed like ENDLESS computer woes and now I am getting some INCREDIBLE feedback on my recent health issue! THANK YOU! Y'all help keep my heart healthy ya know! CARYN - the sprained sternum is QUITE interesting as that is where the pain was. I would touch my sternum and it felt bruised, although that disappeared as well! I did not do anything to my knowledge to sprain it, but then one never knows, eh? LOL! I'm glad YOU are okay as I can only imagine dealing with that AND the little one! BTW - YOU are just a BABY! Only a year older than my oldest daughter! He, he ... AND YES, I am a believer in ALL things for a purpose! Love back atcha girlie! CAROLYN - ROTFLBO!!! You are TOO funny girl! LOL! Now you'll REALLY laugh when you find out that my computer is literally a HOP away from my bed!!! NO skip, NO jump, just a HOP, literally!!! ROFL! PWD - you are for all practical purposes, RIGHT ON THE MONEY!!! I do have a hiatal hernia and reflux (not in the way MOST people think of it) and I do believe my culprit was my overdosing on coffee this winter. I am not normally much of a coffee drinker, however, it is already prepared by my sweetie first thing in the morning and SO easy on COLD days that kept me in my room with the heater on. I have gone back to drinking herbal tea since my little adventure! I don't take any other meds other than my Armour Thyroid and a low-dose aspirin which has now been upped to a regular aspirin per day. I don't drink carbonated beverages either and haven't in nearly 20 years. On occasion and on a HOT day, I will take a sip or two from Robert's or one of my son's glasses every once-in-a-while which amounts to maybe two or three times a year! The only other thing that I enjoy is a glass or two of red wine in the evening and I have eliminated that as well for the same reason. Rather than aiding my digestion, it is having the opposite effect!!! It could ONLY happen to me! Just kidding, but I am learning what my body will handle and what it will not, which is, at the present time, leaving me with very few options! LOL! I now empathize with my mother who just a few years ago asked, "what CAN I eat"! As you can see, I have inherited the weakness in my digestive tract, but look forward to overcoming the troubles ASAP! You just HAVE to be in the medical profession darlin'! SARAH - He, he ... your visual makes mine look tame girlfriend!!! LOL! I shall never look at NOODLES the same EVER again!!! ROFL! I believe my colonoscopy will be where they sedate you to the point of not caring about much of anything!!! HELP! WOW! So young girlie to have had one, let alone two. Is there family history? KAREN - You have known me for SOOO long now haven't you??? Thank you for the reminder girlfriend and may I say that your profile pic makes me smile BIG every time I see it because I KNOW your personality!!! You are such a HOOT girl! Okay, back to the GOOD stuff!!! 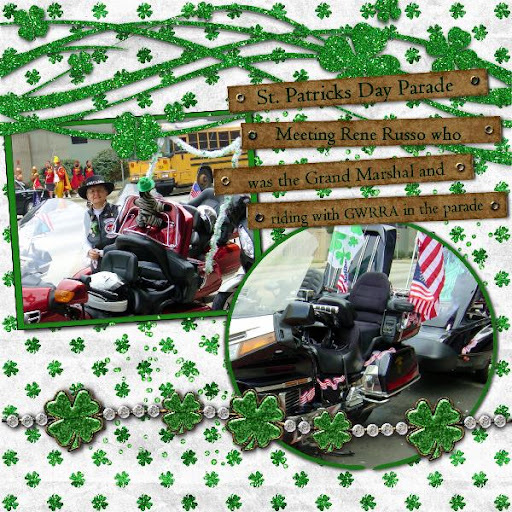 I know it is PAST St. Patrick's Day, however, I had a couple of VERY dear friends create some layouts for me using *Shimmerin' Shamrocks* and I've just got to share them! 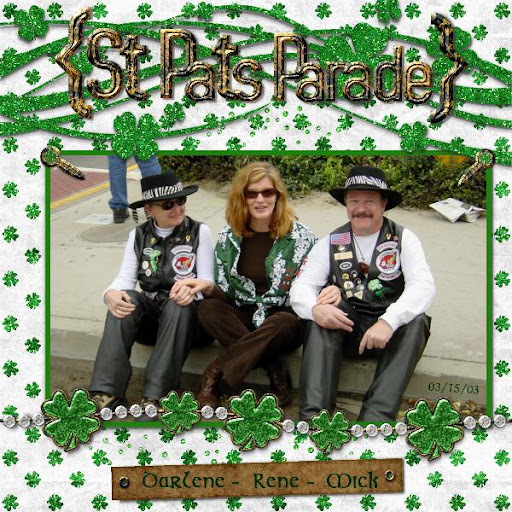 Darlene, a good friend and CT, has created a two-page layout from a St. Patrick's Day parade in Los Angeles, California back in 2003 in which the actress, Rene Russo, was Grand Marshal and is shown sitting between Darlene and Darlene's husband, Mick! Rememeber the gentleman that made PINK look SO good with my *INTERLUDES* collab with Snowsmoon's Design??? Uh, huh! One and the same! 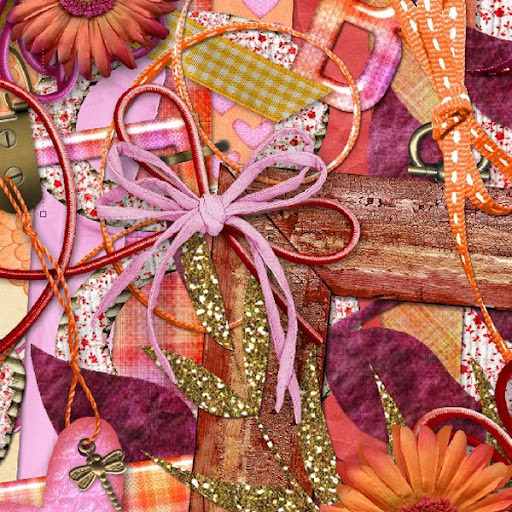 What a LOVELY and FESTIVE set of layouts Darlene! TY! 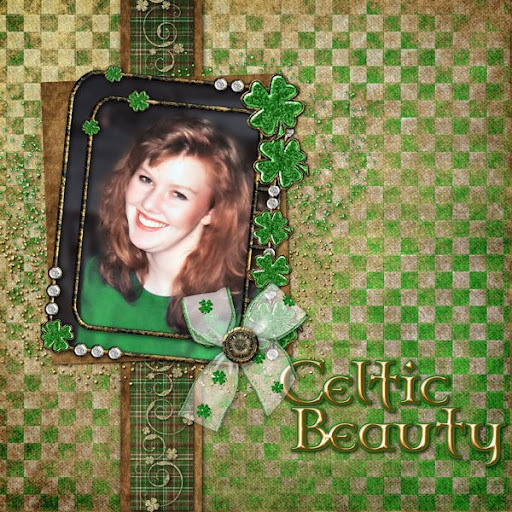 Monna Lainson of Monna Lainson Designs and a VERY, VERY dear friend has not ONLY created a layout of her "Celtic Beauty" below, but has offered it on her blog as a "scrapatit" aka QP for y'all and I was not here to link to it and wish to do so now. Isn't her daughter GORGEOUS??? Oh my, you just HAVE to LOVE that red hair!!! Thank you sweetheart, you ROCK! CLICK HERE TO BE TRANSPORTED TO MONNA'S BLOG TO DOWNLOAD! Please leave her some SCRAPLAND lovin' and tell her I said HELLO Monna Mia! P.S. I shall be back soon with some NEW goodies for you! 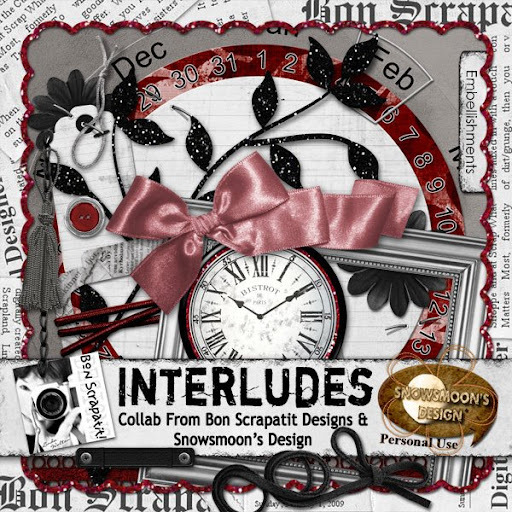 ANOTHER INTERLUDE Y'ALL! LOL! A LAYOUT SHARE AND SOME EXCITING NEWS!!! 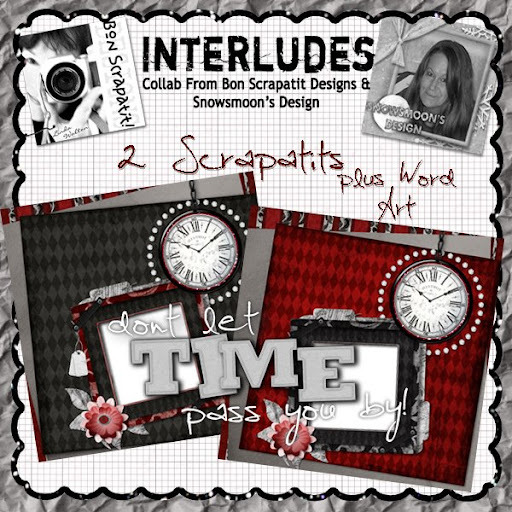 Okay, so I have had entirely TOO much FUN working with *INTERLUDES*!!! Actually, today is the first time that I have an opportunity to work with it on a personal level! I usually make a "scrapatit" or two to get a feel for how things are working. I take my time and will change things around endlessly at times, but I work my canvas until I feel a sense of calm and am comfortable with the way things are looking! SPEED-SCRAP??? Not THIS girl!!! And if I did, I guarantee you I'd pull that thing apart and fix it! ROFL! Isn't it AMAZING how well we get to know ourselves? I SO admire those of you that can put a layout together in your head and then PRESTO, "speed scrap"!!! LOL! I had started to scrap with one of my wedding photos from back in the 70's before thinking of my daughter Joan's wedding photo of her and her hubby kissing like the days of "Gone With The Wind"!!! BINGO and VOILA - I LOVE it!!! OOOOH Rhett! 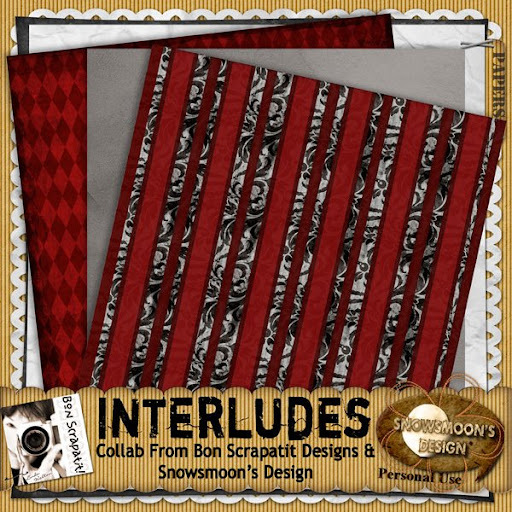 *sigh* I hope that you will find that PERFECT photo to use with this, my first scrapatit using my collaboration with Snowsmoon's Design, *INTERLUDES*!!! And that is not the ONLY addition to this classic creation, Dawn has for us all some AWESOME alphas and tomorrow she will have even MORE goodies!!! WOO HOO! Thank you girlfriend! This has just been WAY too much FUN!!! Sorry to be SO short tonight, however, we did not go to Dillon's birthday party today but will be leaving early in the morning for some special family time with he, his brother and his parents, which just happens to be his actual birthday and we shall CELEBRATE with him then! I, of course, shall be taking LOTS of photos!!! BETH W - you are EXACTLY right as to why we missed last year!!! In my need for reading glasses to read the fine print, I had looked at the invitation without them and read the "11" as a 1!!! The second "1" just simply melded right into the other! 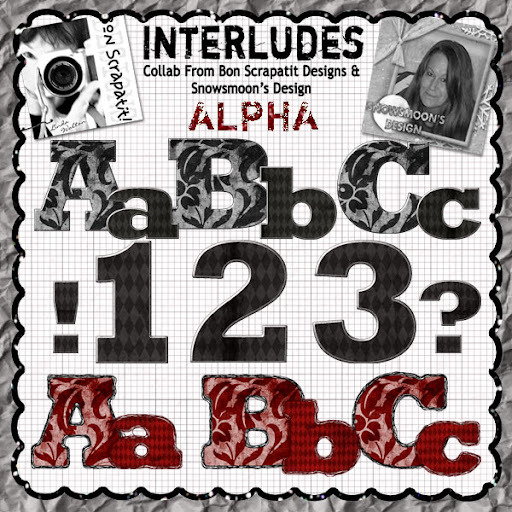 BETH, please e-mail me at bonscrapatitdesigns (at) gmail (dot com) for your EXTRA goody!!! Now THAT is a FABULOUS memory darlin' and CONGRATS!!! Let's here it for Beth!!! WOO HOO!!! KAREN H - Awwww girlfriend, you remembered too!!! Shoot me an e-mail and I shall send you a goody too! MWAH! While you are there, read all about Dawn's latest adventures with her DARLING grandsons! She has had some WONDERFUL one-on-one time with each of them! 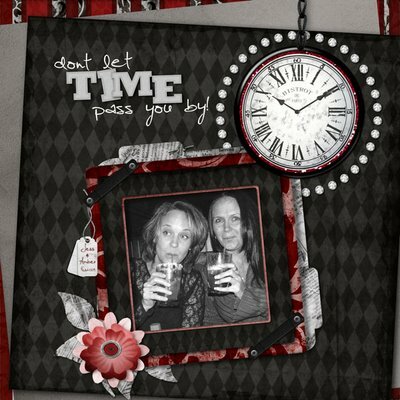 I used one the of the patterned circles from the "date wheel" beneath the photo! 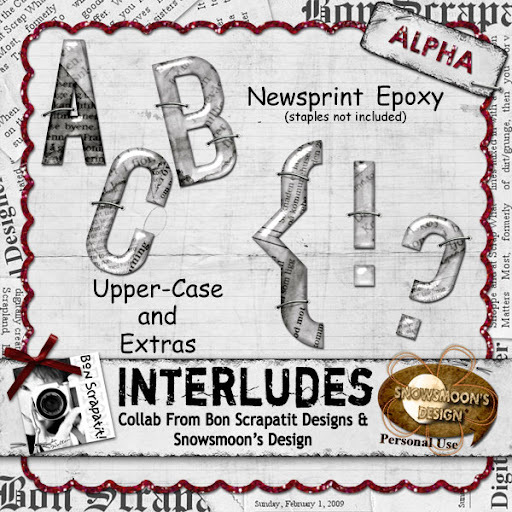 *NEWSPRINT EPOXY ALPHA*, PART TWO IS HERE AND IT'S PAR-TAY TIME!!! OMGosh y'all, I am SOOOOO late for bed for about the third morning in a row!!! I have just been SOOOOO slow and actually stayed OFF of the computer for the BIGGEST part of the day yesterday (that gives you a clue as to HOW late is really is ... he, he ...). I shall be QUICK and then I shall try my hardest to catch up with y'all during the next week! 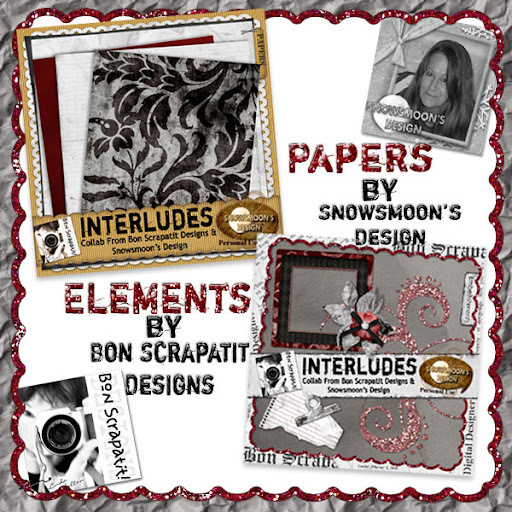 I would like to thank you ALL so very much for your MOST generous comments - I am DEEPLY touched and am SO happy that y'all are REALLY enjoying the FIRST collaboration between Snowsmoon's Design and Bon Scrapatit Designs!!! I know that Dawn GREATLY appreciates all the loving as well as I do! THANK YOU! 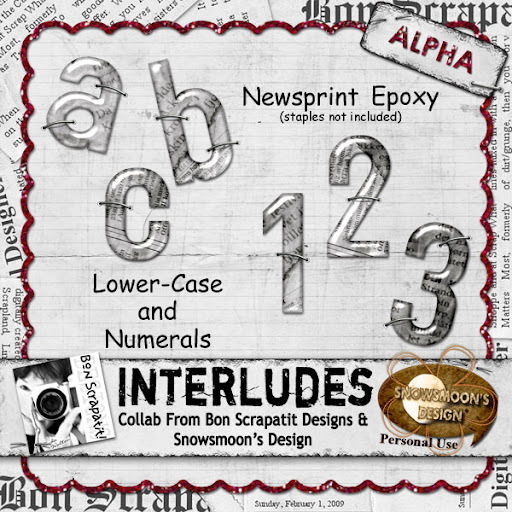 I am leaving you with PART TWO of my *Newsprint Epoxy Alpha*, which coordinates with *INTERLUDES*! I know that Dawn has an alpha for y'all as well and I don't think she has posted yet as she has had the privilege of having her grandson, Baby Javi, stay over by himself!!! Needless to say, I don't think Grandma Dawn has had ANY time to do much of anything other than babysit! How SPECIAL is that? I am missing you GIRLFRIEND! Stop on over and leave her some LOVE. I just KNOW that she is missing us ALL and if you've not downloaded her BEAUTIFUL scraptits/quickpages and WORD ART, what are you waiting for??? They ROCK! I am posting a photo of Dillon below! He is such a sweetheart and is QUITE the entertainer! This photo was taken last September at his cousin, Lohgan's FIRST birthday party! They only live about three blocks from each other!!! Isn't that SO cool? YES, I shall be snapping photos of ALL of the little ones gathered together to wish their cousin a HAPPY "2nd" BIRTHDAY!!! If I don't see y'all much later tonight, I shall see you on Sunday!!! Have a GOOD one and KEEP ON SCRAPPIN'! HAPPY BIRTHDAY DILLON!!! PAPA AND LINDA LOVE YOU SO MUCH SWEETHEART! *INTERLUDES* DATE WHEEL REPLACEMENT HAS ARRIVED!!! Okay y'all, here is the replacement for my BIG, BIG BOOF! ROFL! I am SO sorry and as hard as I try to inspect everything before zipping, I do miss every now and then! So glad I am human! LOL! Included in this download are SEVEN (7) individual PNG files for you to put this baby together with as YOU wish! WOO HOO!!! I have also given you a sample image in the zip file as well as my posting it here so that you can see how I've customized to meet my project needs. You will also find some basic instructions as to how to put the wheel together for those that might need them. HAVE FUN and SCRAP HAPPY!!! 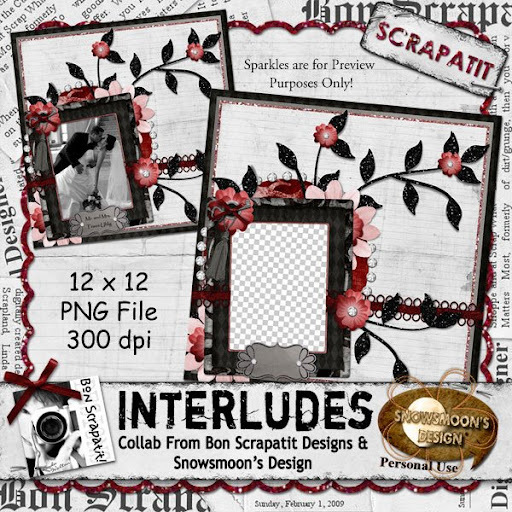 I would SURELY love to see what y'all do with this scrapkit!!! For my own project, I have eliminated the "years" text and replaced with my birth year using my coordinating *Newsprint Epoxy Alpha* and embellished it with the glittered foliage! The only text that is not in a separate file is "months". 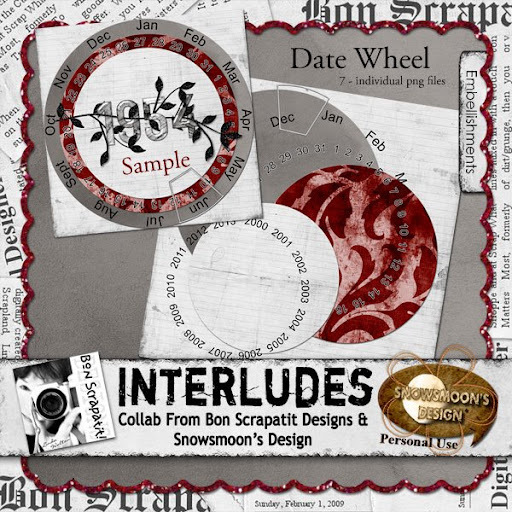 It has been brought to my attention that the "date wheel" included in Part Three of *INTERLUDES* is missing the month of MAY! EEEEKS! I am SOOOOO sorry that I did not catch that when working with the template! MY BAD! AND .... while I was researching the missing month and giving it a fix, I realized that after one of you posted a comment about the MIA month of May and wishing more detailed instructions on how to use it, that this "date wheel" was really not very functional, if at all!!! 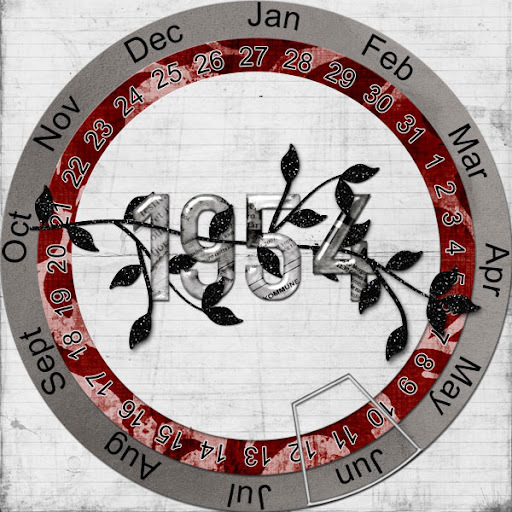 SOOOOO, I am completely reconstructing the "date wheel" and EACH piece, with the exception of the "months" text, shall be included in a separate PNG file so that you can ROTATE the day and year text circles to your liking. I've found that the links I THOUGHT I had copied and pasted from THE CANDY JAR to the download links here on my blog were NOT there!!! Thank you Sharon for the "head's up" about REDJU! For anyone transported to her blog, she ROCKS in the CU world! 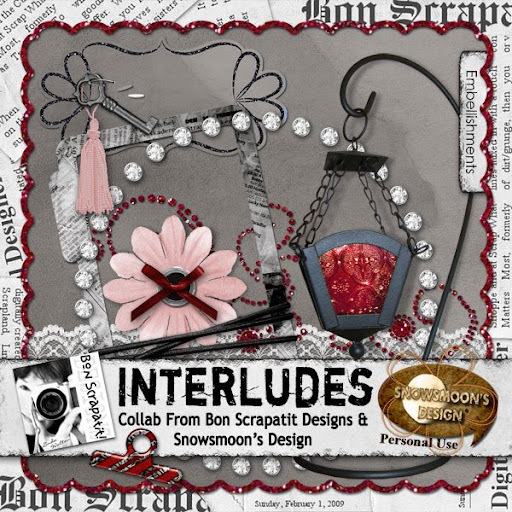 He, he ... ANYHOO, both THE CANDY JAR links have been fixed for both Part One and Part Two of *INTERLUDES*! 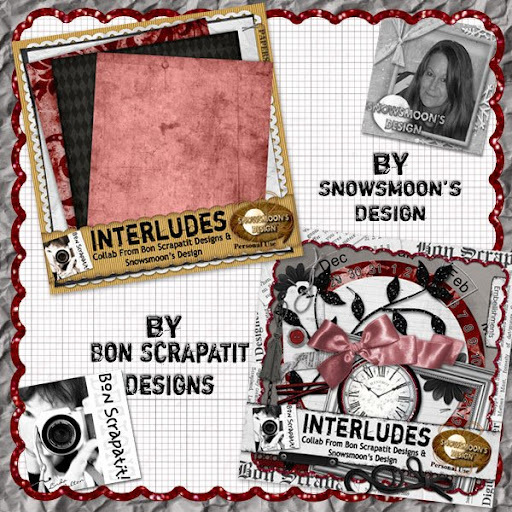 I'm making a REEEEEAL quick stop in to deliver today's goody, *INTERLUDES*, Part Two of my FIRSTEVER collaboration with my BFF and designer colleague, Dawn aka Snowsmoon's Designs! Hop on over to Dawn's blog to collect today's PAPERS (her preview image is clickable and leave her some big SCRAPLAND lovin'!) and right on down to the bottom of my post for the coordinating embellishments!!! While you are there, click on her store link to see ALL of her kits that are ONLY $2.00 this week during ONE SINGLE SEED'S grand opening GALA! Thanks to all who have shared so far, you keep me SMILING BIG!!! I shall be back tomorrow with Part Three, as will Dawn on her blog! We will each have a matching alpha for you and Dawn has some SWEET surprises so y'all come back now, HEAR!!! MWAH! 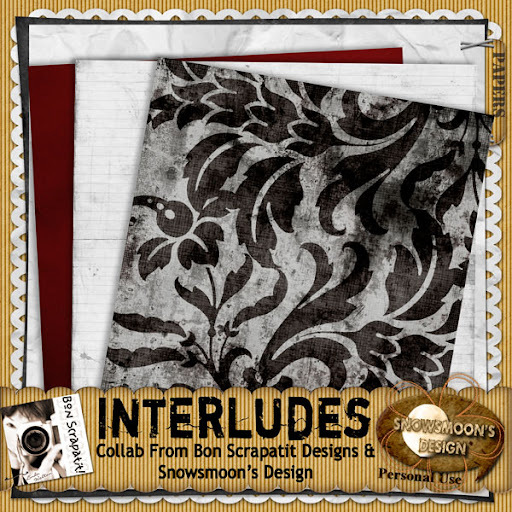 *INTERLUDES*, A COLLAB BY SNOWSMOON'S DESIGNS AND MYSELF HAS ARRIVED!!! How goes it in SCRAPLAND tonight? This morning? AFTERNOON anyone? LOL! I must say that I feel a bit strange at times when beginning my posts because I am chatting with LOVELY ladies (and gentlemen in hiding ... he, he ...) from ALL over the globe and ALL different times of the day! I suppose I could say, GOOD "MAN" Y'ALL!!! ROFL! Good Morning, Afternoon and Night! He, he ... MAN y'all!!! Thank you for ALL of your LOVELY comments even during my MIA status! Y'all make THIS girl feel SO loved and I am REALLY jazzed about some of you sharing about your genealogy research as well. I am SOOOO stoked! Not only that, but we are getting more of our children on Facebook, which means we get to see our grandchildren A LOT more!!! WOO HOO! Wait until they all get my invites from GENI!!! That place is DA BOMB I tell ya. It is like Facebook but for your family only and y'all can use it as a family social network - TOTALLY awesome!!! Okay, as previously announced, Dawn aka Snowsmoon's Designs and I have teamed up for our VERY first collaboration together and I've been challenged and excited ALL at the same time!!! Dawn presented me with a BEAUTIFUL set of papers last month after she and I had talked about collabing and deciding on a color palette. Reds, black, white and grays are one of my ALL-TIME favorite palettes just because they SHOUT OUT "classy/classic" and are really VERY versatile across the generations. My challenge? Create ALL of the embellishments!!! I hope I have done Dawn's GORGEOUS papers justice because they are ROCKIN' and are SO perfect for SO many different types of photos! Hmmmm .... I think I am going to need to scrap this week, eh? I've been missing the opportunity to do so and there is NO better time than the present, right? Uh, HUH!!! LOL! Thank you to those of you still posting layouts to the guestbook - I LOVE THEM ALL!!! Come on now, DON'T be shy, we all start at the beginning and every scrap is a MASTERPIECE! Have an AWESOME week everyone!!! 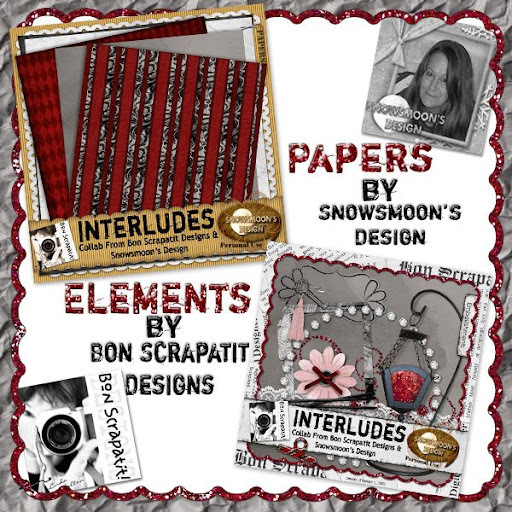 Y'all make sure to come back all week long to grab more papers from Dawn's blog, embellishments from ME and an alpha or two and some "scrapatits"/QP's as the week winds down!!! *INTERLUDES* previews are located below with a link to Dawn's blog attached to her single preview and mine located beneath mine as usual! Please make sure to leave my BFF some BIG lovin' for ALL of her hard work and LONG hours in helping to make this a possibility for the TWO of us AT LAST!!! MWAH! Bon Scrapatit! P.S. Don't forget about the AWESOME grand-opening over at ONE SINGLE SEED and EVERYTHING in the store is 25% off this week! HAVE FUN! 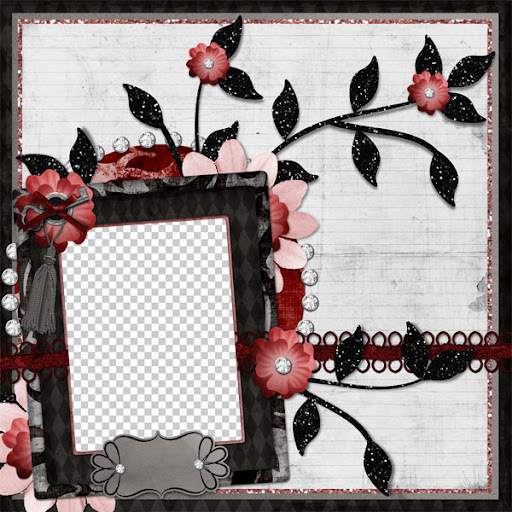 A GRAND OPENING, A LAYOUT SHARE AND A FREEBIE FROM SNOWSMOON'S DESIGN!!! Hope to find everyone gearing up for the INCREDIBLE week ahead!!! 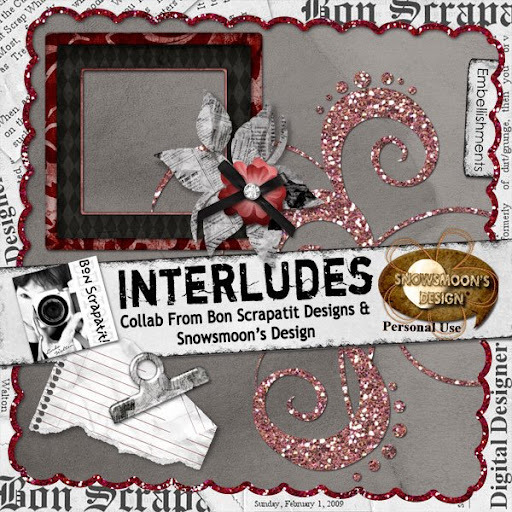 I am SOOOOO excited as TOMORROW night, my BFF, Dawn aka Snowsmoon's Design and I are going to be debuting our VERY first one-on-one collaboration and it is AWESOME! 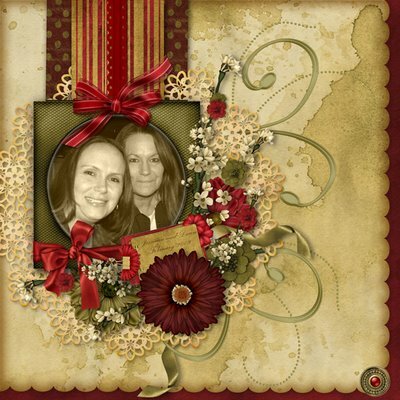 Dawn and I are going about this a little unconventionally in that she has designed ALL of the papers and I, the embellishments!!! This has been quite a challenge for me as I am used to designing papers, embellies, papers, embellies and so on!!! I've NEVER just designed a paper pack or just embellishments so this has been a FABULOUS experience for me and just wait until you see Dawn's GORGEOUS papers!!! WOO HOO! Yum, yum, yummy, YUM! 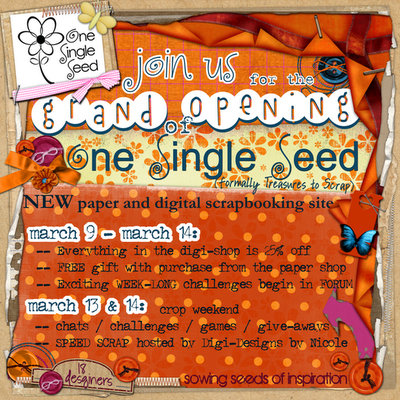 Tomorrow, Monday, March 9th, marks the GRAND OPENING of ONE SINGLE SEED formerly known as "Treasures To Scraps", with FABULOUS new designers, a WHOLE new look and both a Paper and a Digital store to serve your scrapping needs.! Click on the image above to be transported to ONE SINGLE SEED to join them this week for LOTS of FUN, GAMES, CHALLENGES and GIVE-AWAYS! 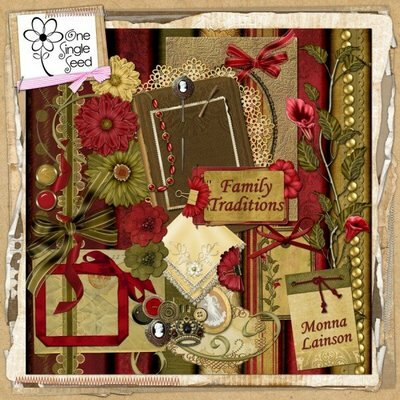 Monna Lainson is a VERY dear friend and a designer at ONE SINGLE SEED and she has just debuted a GORGEOUS heritage kit, *Family Traditions*, which is currently available at HALF-PRICE! 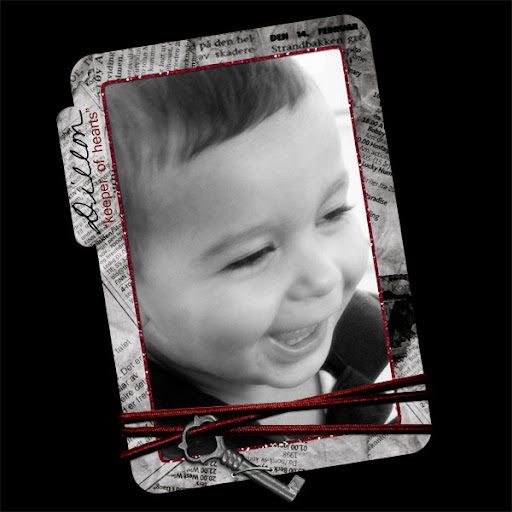 Click the image above to be transported directly to Monna's store and her NEW beauty that will have your PRECIOUS family photos preserved in style! 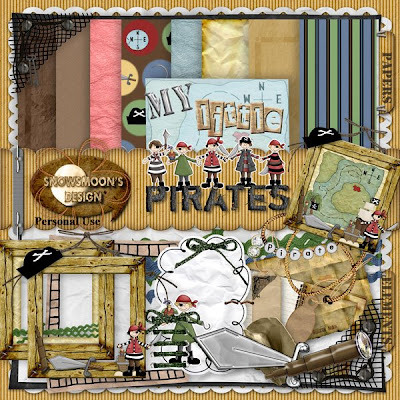 Dawn aka Snowsmoon's Design has created a LOVELY layout using Monna Lainson's, *Family Traditions* and is sharing with ALL of us in SCRAPLAND as a QP!!! Click the image above to be transported to Dawn's blog to download this BEAUTIFUL page! Thank you girlfriends! Remember to head on back over later tonight for the FIRST part of my collaboration with Dawn! Wishing you all a FANTABULOUS week ahead and may it be a SCRAP-HAPPY one! I will share some of my findings with y'all as I progress. This is going to have me posting photos for my children and giving them a glimpse of their father's side of the family as I had found quite a bit of info while researching my own that five years ago. Funny, Joan was just mentioning to me yesterday that she had recently discovered some info about a cousin she has never known and I was happy to tell her that I will have quite a bit of information for she and her siblings to share in. In my own research on my father's side, I had found birth and death records of three children my grandparents had before coming to the US from England that no one else knew about. AMAZING, absolutely FASCINATING to be able to find missing pieces of your family puzzle and begin to put them together! Please give me some feedback any of you who are already familiar with and/or set up on GENI!!! I shall appreciate any info you have to offer! Thank you! I will update you from time-to-time as to the new relatives that I am being connected with on my father's side of the family. I am SOOOOO excited! I have cousins I've NEVER met! Okay, now for a little SPECIAL something from my DEAR, DEAR friend, Carole! 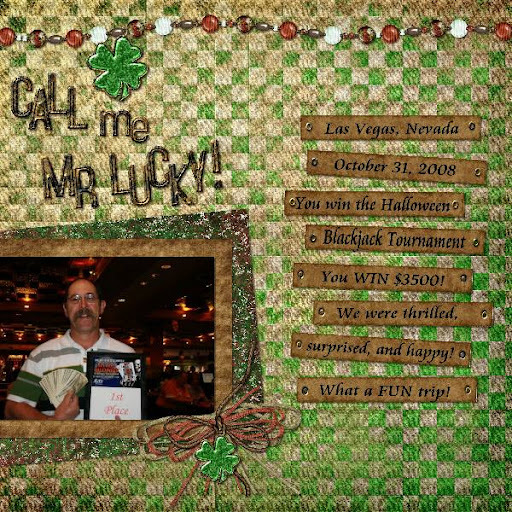 She sent me a layout the other day that she did for her husband after his BIG win during their trip to Las Vegas last October. I LOVE her title and Harold's photo and *Shimmerin Shamrocks* are a WONDERFUL match. 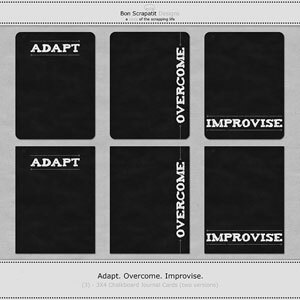 Carole has generously shared her layout with ALL of us in SCRAPLAND by way of a "scrapatit". Thank you Carole! 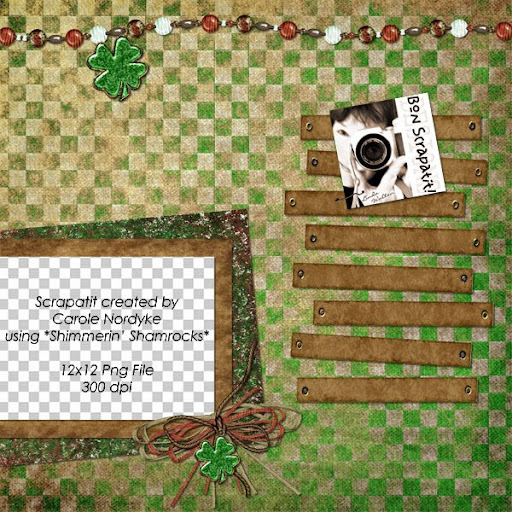 Just a reminder that *Shimmerin' Shamrocks* is on sale at half-price during it's debut at Digital Candy for ONLY $2.50 through this Sunday, March 8th!!! Have a FANTABULOUS weekend everyone!!! REMEMBER: It's SCRAP-HAPPY HOUR 24/7 in SCRAPLAND!!! WOO HOO!